Home / Humour / Humour: 10 features of new Rs 2,000 currency note you must know. Now! Humour: 10 features of new Rs 2,000 currency note you must know. Now! Never before in the history of any country, a currency note has captured the imagination of the people the way India's new Rs 2000 note has done. To borrow a phrase from Apple, it is the best currency note India has made. Sure, the world is full of currency notes, but the new Rs 2,000 note is the most advanced, most feature packed note ever made. It's slick, slim and extremely beautiful. It only comes in one colour, the gorgeous Rose Gold, because any other colour will be an affront for it. It's great, the best note ever made by any country. Now, you people already know a lot about the new Rs 2,000 currency note. You know that it has a nano GPS, which enables extremely accurate tracking of the note when people are using it. And this tracking works flawlessly forever because the note uses a special ink that also charges the nano GPS. This tracking will help the government deal with the issues of unaccounted money. This much everyone has told you. But this is not all. The Rs 2000 note has other features too. Here are 10 that stand out. The nano GPS in the Rs 2000 note can also be used for traffic navigation. To use it, take it out of your wallet. Then hold it in landscape mode on the dashboard of your car and swipe on it from left to right. Digital guidelines will come up on it and will guide you home. There are rumours that the Rs 2000 can be used as a ticket for the upcoming manned Mars mission. We can confirm that the rumours are accurate. Actually the photo of Mars Orbiter in the note hides the code that has details of the ticket. The Rs 2000 has a nano camera and voice recording devices. These get activated with certain phrases that people trying to hide taxes use. Details of black money hoarders are captured using this nano camera and are then sent to the Indian government. If you roll the Rs 2000 note, you can use it as a small telescope. It can then be used to watch objects as far as Mars. There are rumours that the Rs 2000 note comes with embedded Jio SIM card. Although, this seems to be accurate, confirmation can only happen after a "tear-down". 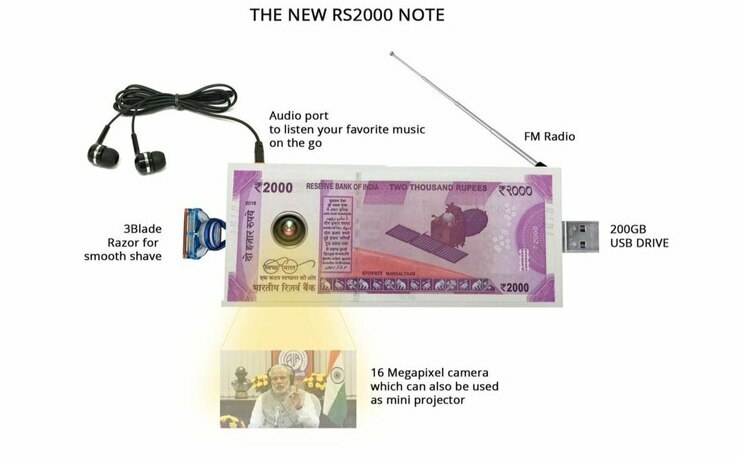 The Rs 2000 note uses special memory cells to store data on it. It can store up to 16GB sanskari songs and videos. The Rs 2000 note software can be upgraded remotely. This will help government add more features to it. The updates are beamed using ISRO satellites. At railways stations that use government's Railtel and Google Wi-Fi, the Rs 2000 will automatically connect to internet. You can roll the Rs 2000 note to use it as a 3.5mm jack to Lighting or USB-C adapter. This will help a lot of rich people who use the iPhone 7 or some other similar phone that lacks the headphone jack. The Rs 2000 can also act as a wireless charger for phones that have this feature. Just keep the phone on the note and the phone's battery recharges in no time. Disclaimer: If you haven't realised until now, this is a spoof. Just too many smart people on social media genuinely believe that the Rs 2000 note has a nano GPS for tracking. This is the most ridiculous bit of misinformation, even by social media's standards. The Rs 2000 is just a regular currency note and it is sad that this needs to be said and emphasised. Another bit is that many of things we have said jokingly here have also been said by a lot of people on social media. It's all for fun and we are not trying to take credit for any joke here. It is possible that many of things written here have already been tweeted or posted on Facebook by several people.